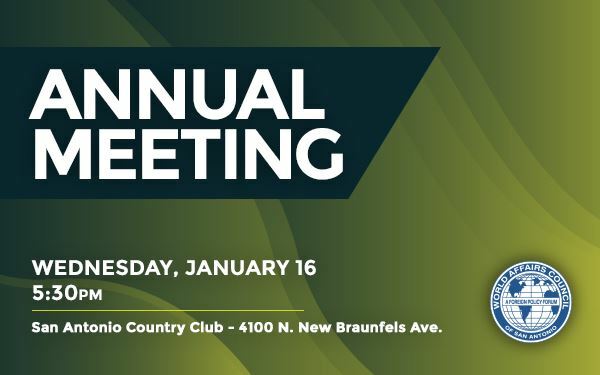 The Annual Meeting of the World Affairs Council’s membership is a chance to attend a short business meeting, participate in the election of officers for 2019, and hear from a special guest speaker on an issue that is important to the Council and its mission. Please join us for this important meeting! Members attend for free, guests are $40. Mr. Amir Samandi, Mentor Coordinator at CAST Tech and Founder and Executive Director of Summer of Service, will speak on the importance of filling the gaps in international affairs education in San Antonio’s educational system, a work that the World Affairs Council is here to help with. To pay with American Express, please contact the Council office at (210) 308-9494.